The pension it is situated in the remote village of Câmpul Cetatii, the last village on the road before the road gets to the Gurghiu Mountains. The family, Erzsebet and Imre Lokodi are very committed to the tourism activity. They were one of the pioneers of this activity after 1990. They have a very interesting guest book in which there are many interesting remarks of the tourists from all over of the world. The grandfather of Imre started to set up a trout farm 70 years ago. The trout farm was developed and now it is one of biggest attractions of the village of Campul Cetatii. Erzsebet is preparing for tourists very tasty food with the specific of the region and Imre is ready to show to the tourist the surroundings. The family initially received tourists in their own house, which is modernized and now there are two rooms in the house with bathroom. This house has a nice garden with vegetables and in the courtyard there are animals, cattle and chicken so the tourist can consume fresh milk and eggs. Additionally the family built another holiday house at the distance of 200 m from the original house. 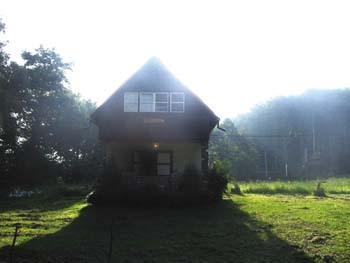 This house is situated at the margin of the forest, in very nice surroundings. It is a house with three sleeping rooms and a nice living room, kitchen and bathroom and in the garden is a nice place for barbecue. The tourists can work at the small farm of the family. Birdwatchers have the chance to watch many species of birds. The other nature lovers will have the pleasure to see many species of wild flowers, butterflies and mushrooms. The accommodation is not far from the trout farm, which is now one of biggest attractions of the village of Campul Cetatii. The tourists can fish or eat trout at the restaurant situated at the trout farm.